Last month, Weather Impact visited Burundi as part of GAP4All, a G4AW funded project (link). GAP4All stands for “Good Agricultural Practices for All” and aims to deliver information services to Burundian small-scale farmers through an Agri-Coach app. With such service, farmers should be able to decide: 1) What crop to plant where, 2) When to plant and perform farming activities, and 3) How to do this for optimal results. This kind of information is believed to result in considerably higher yields while reducing (climate) risks and preserving water and land, increasing the income for smallholder farmers throughout the country. The week-long trip to Burundi started with visits to various institutes and companies in the capital Bujumbura, such as the Dutch Embassy, the Ministry of Agriculture, ISABU (Burundian seed institute), and IGEBU (Burundian meteorological institute). For such a project to succeed it is important that it is endorsed by all such institutes and governmental organisations. Also, they possess a wealth of local and practical knowledge that is needed for a correct implementation of such an information service. Multiple workshops were organised about weather forecasts, app visualization/design and GIS to exchange insights and ideas. 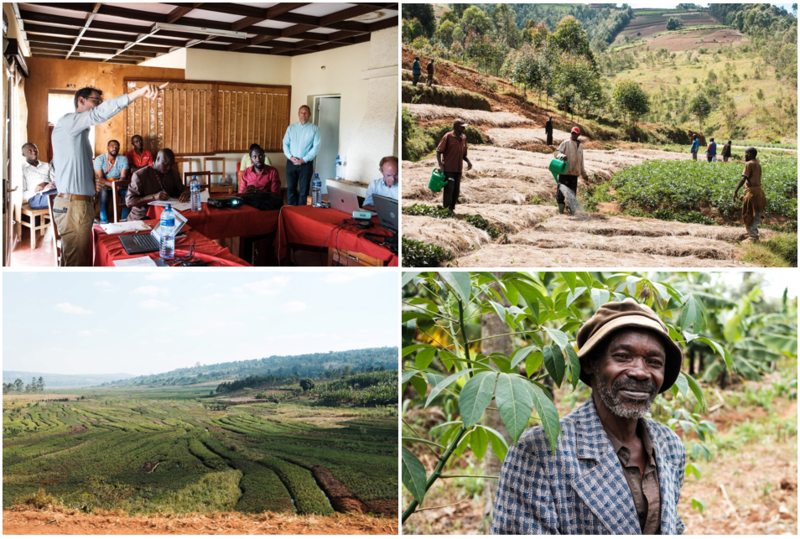 After these -somewhat formal- visits we embarked on a small roadtrip across Burundi to visit farming communities: the second main goal of the trip. The project will be piloted in the Gitega, Karusi, and Kayanza provinces, so we visited one group of farmers in every province. The small-scale farming communities will be the end users of the Agri-Coach app and their opinions are therefore vital for a successful project. Most farmers have no scholarly background and do not often use technological devices such as (smart)phones, so making an information service that is interpretable by many will definitely be a challenge.